Square Enix PlayStation 2 RPG Radiata Stories is getting a spiritual sequel on the Nintendo DS courtesy of Atlus. Atlus has announced that it'll be bringing a title called Radiant Historia to the Nintendo DS in Japan later this year. For those wondering why they should care, Radiant Historia is basically a spiritual sequel to 2005's very cool Square Enix and tri-Ace (of Star Ocean fame) PlayStation 2 RPG Radiata Stories. Just in case the name didn't clue you in to Radiant Historia being related to Radiata Stories in some way, the game is being created by Satoshi Takayashiki, the man behind the idea for Radiata Stories, with other previous Stories staffers working alongside him including character designer Hiroshi Konishi. Radiata Stories had 175 recruitable characters, so the return of the character designer is pretty key. If you've never heard of Radiata Stories and like to partake in the RPG genre, go pick up a copy as soon as you can. It's a fun romp that involves kicking anything you can, including other characters that will sometimes attack you if you kick them too much. These characters exist in a persistent world and all have their own schedules in the game's day/night system. 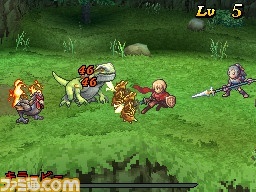 Combat works very much like games in the Tales and Star Ocean series, with real-time battles that are entered by contacting a monster on the field. Avoiding spoilers, the story also has a point at which it splits into two, affecting characters that will join your party and the storyline. Aside from the similarities in staffing and name, Historia has no direct connection to Radiata Stories. The game is set in a land where people will occasionally turn to sand, with a main character that goes by the name of Stok. Stok becomes wounded in a battle, and awakens in Historia, where he is given the power to travel through time and space. He'll use this power to travel to both the past and future of two parallel worlds. Battles use a "Grid System," where placement, positioning, and skills determine attack damage. More detailed information is available at Andriasang. The current description gives me a Chrono Trigger and Chrono Cross feel, and that combined with being a spiritual sequel to Radiata Stories makes Radiant Historia an RPG to look forward to in my book. There hasn't been any mention of a mass of recruitable characters, or of kicking everything in sight, but I'm hoping. The game will be released on November 4 in Japan, and because it's coming from Atlus I'm sure we'll be seeing it in other regions too.